The College’s triennial conference, Advancing Excellence in Healthcare 2014, takes place on the 19th and 20th June at the SECC in Glasgow. The conference programme includes a series of symposia, covering a range of topics in medicine, surgery, dentistry, travel medicine, podiatric medicine, and more. In anticipation of the History of Medicine Symposium on Friday 20th June, we’ll be posting about some of the sessions and looking at how their subjects are reflected in the College collections. We have already talked about Professor Sir Graham Teasdale and the 40th anniversary of the Glasgow Coma Scale. Now we move on to Dr Dermot Kennedy’s talk, Glasgow’s health and housing: a tale of two cities, three heroes. Few items in the College Library demonstrate the “two cities” aspect of Glasgow’s history better than the photograph albums of Thomas Annan. Annan was a Scottish photographer active in the late 19th century, and is recognised today as a pioneer of photography. The two books in question are The Old Country Houses of the Old Glasgow Gentry (2nd ed., published in 1878) and Photographs of Old Closes, Streets etc., taken 1868-1877 (published in 1881). The first of these books features a series of photographs of country homes around Glasgow, belonging to some of Glasgow’s most famous old families and gentry. The book was intended to be a record of some of Glasgow’s oldest landmarks and to prevent the houses and their former owners from being forgotten. Some of the houses included in the book have since been converted for other purposes and can still be found standing as flats, golf clubhouses, or within the city’s public parks. 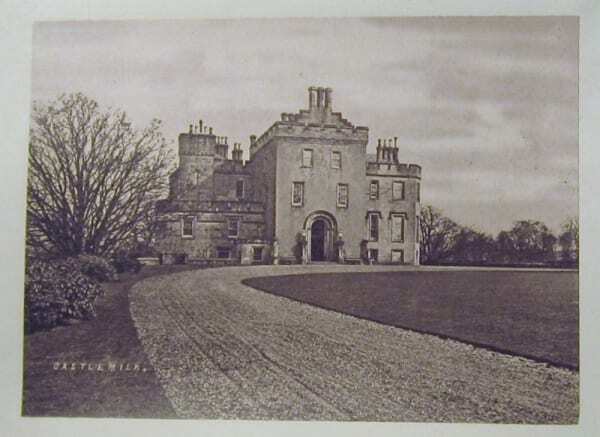 Many of them, however, have been demolished and the areas they once occupied now bear little resemblance to the countryside depicted in Annan’s photographs. Today’s Glaswegians are likely to recognise the names of many of the houses, such as Castlemilk, Gilmorehill, Possil, or Kelvinside, although they are far more likely to associate them with busy areas of the city than with country houses. The 19th century occupants of these houses were, according to the authors, those who regarded Glasgow as their home and were prepared to serve the town in offices such as Provost, Bailie, or Dean of Guild, and who could be depended upon to stand up for the rights of the city. The authors decry the newer breed of merchant “who lives as far from Glasgow as he can, cultivates other society and send his children to English schools to make sure they don’t speak Glasgow.” The occupants of these houses certainly had a strong involvement in the life of the city, whether as successful merchants or as magistrates, but their style of living was far removed from the conditions endured by other inhabitants of Glasgow. The second book is a very large volume, bound in green leather and bearing the Coat of Arms of the City of Glasgow. The photographs in this book show a completely different side to the city from the fine country houses of the gentry. In the 1830s and 1840s the population of Glasgow increased rapidly and those who could, moved westwards. They left behind grand and elegant houses in the centre of the city, which were divided in to multiple dwellings for working class families. The open ground formerly accompanying these buildings was also sold off, and rows of tenements were crammed into the remaining spaces. This led to serious problems with overcrowding, and by the 1840s there were over 600 common lodging houses in the city with about 10,000 inhabitants. In addition to the intense overcrowding (in some cases, up to 40 men were crowded into a single room), there was no real sanitation to speak of. Middens were often kept in a close until a country farmer could be persuaded to buy them as manure, and most of the populace relied on the town wells for water until the Loch Katrine water works were eventually opened in 1859. The combined effect of overcrowding, poor sanitation and poor diet was, unsurprisingly, rampant ill-health. Rickets was a common complaint, and the city saw four major outbreaks of cholera between 1832 and 1866. The Faculty of Physicians and Surgeons of Glasgow offered free vaccinations against smallpox, but resistance to vaccination was high until it was made compulsory for infants in 1863. The College’s copy of this book was presented by Sir John Ure, a politician who strove all his life to improve social conditions in Glasgow. He held various positions in the Town Council before ultimately becoming Lord Provost in 1880. During his career Ure oversaw many changes to the slum conditions in Glasgow, most notably thanks to the City Improvement Act in 1866. 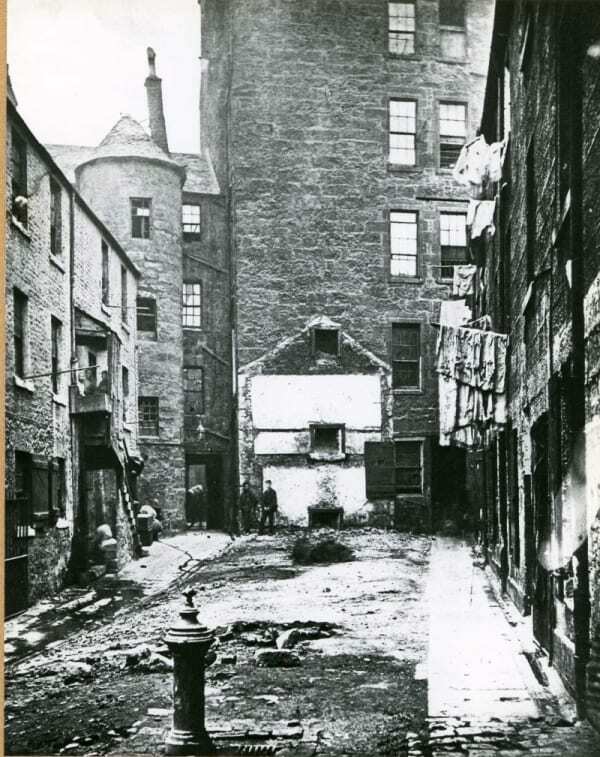 When this act was passed, Glasgow set up an Improvement Trust to buy over and demolish the crowded housing around the High Street, Glasgow Cross and Gorbals areas of the city. The slums began to be cleared, and by the time Annan’s book was published many of the scenes depicted within had already disappeared. 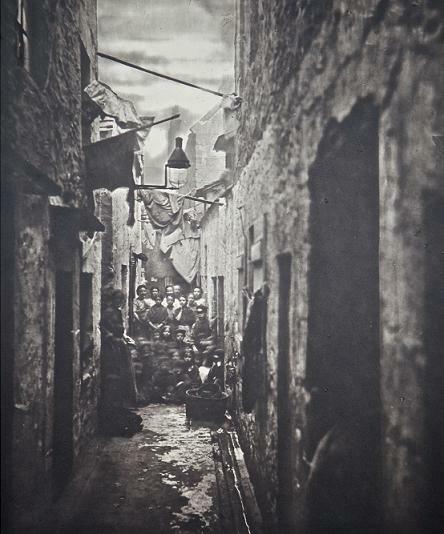 Looking at two of Thomas Annan’s collections of photographs gives us at least one way of looking at the “two cities” aspect of 19th century Glasgow. To find out more about the History of Medicine Symposium, or for more information and booking details for the triennial conference, please visit the Advancing Excellence in Healthcare website: http://aeh2014.rcp.sg.